Love rye bread? Love crackers? Hate throwing your unfed sourdough starter discards down the drain? Then I have a recipe for you! I basically subbed rye flour for the whole wheat and caraway seeds for the herbs, and added a few of my own notes. These are crunchy-good and rye-tastic. - Mix together the flour, salt, sourdough starter, butter, and caraway seeds to make a smooth (not sticky), cohesive dough. - Divide the dough in half, and shape each half into a small rectangular slab. Cover with plastic wrap, and refrigerate for 30 minutes, or up to a couple of hours, until the dough is firm. - Very lightly flour a piece of parchment, your rolling pin, and the top of the dough. - Working with one piece at a time, roll the dough to about 1/16" thick. Try to keep the edges as neat as possible. - Transfer the dough and parchment together onto a baking sheet. - Lightly brush with oil and then sprinkle the salt over the top of the crackers. - Cut the dough into 1 1/4" squares; a rolling pizza wheel works well here. - Prick each square with the tines of a fork. - Bake the crackers for about 18-20 minutes, until the squares are starting to brown around the edges. Keep an eye on them because if they overbake and brown too much, they will taste bitter and burned. - When browned, remove the crackers from the oven, and transfer them to a cooling rack. Store airtight at room temperature for up to a week; freeze for longer storage. 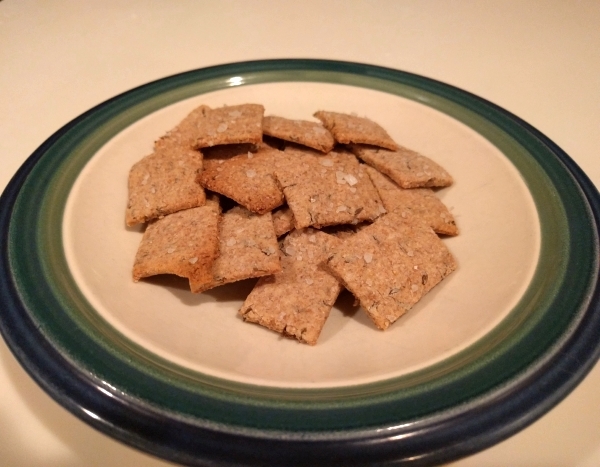 Yield: about 100 crackers, 20 servings. Thanks for posting that recipe. I prefer yours to the KA version I think. I really liked this - as much as I liked the King Arthur recipe, using rye flour made it even better! Thanks for sharing. A quick technique suggestion - rather than use a fork and pierce all the crackers, I used a docking wheel, something like this - https://smile.amazon.com/Meta-U-Time-Saver-Pizza-Roller-Docker/dp/B06X9QWJVV/ref=sr_1_3?ie=UTF8&qid=1534523323&sr=8-3&keywords=dough+docker+roller&dpID=41XV3koS3KL&preST=_SX300_QL70_&dpSrc=srch You can use this to parbake pizzas as well, or any baked goods that tend to puff up when you don't want them to. Also, I've been looking into using brewer's spent grains. For the non-brewers among us, those are the grains used to make beer. They've been sprouted, roasted to kill the sprout, and then soaked to remove the fermentable sugars. After that, they've still got lots of goodness in them! Protein, fiber, flavor and more! Brewers tend to sell, or give, them to hog farmers - pigs love the spent grains. Most brewers will give them to you for the asking. Two quick warnings - you don't need much, and you want to get them the day the were used and then dehydrate them - wet grain goes bad REAL fast! I put a 1/4 inch layer on a sheet pan and bake it at 180F for a few hours, stirring from time to time until the grain is quite dry. Once dry, I freeze them in 100 gram lots in baggies. If they are dry enough, they'll won't turn into a brick. From what I read, you can add about 10% of the spent grains to crackers or other baked goods before people object to their presence. They add flavor, crunch and color variegation. Despite the 10% rule of thumb. I added about 50 grams to this recipe and the results were great!